Sunday is a sacred day in Paris, although not necessarily in the religious sense. This “sacred” day is intended to be a day reserved for much needed rest and relaxation in the form of lazy brunches and leisurely afternoons. While most restaurants and cafés will be open and bustling on this day, you will discover that the majority of shops are not open with only a couple of exceptions, one of them being the Marais. Sleep-in and relax while making the most of your Sunday in Paris with a trip to this trendy and always animated neighborhood offering a delightful and truly unique taste of Parisian culture. Brunch has taken off more so than ever before so do as the Parisians are doing and start the day with a late leisurely breakfast, or brunch. Nestled in the Marais neighborhood, Rose Bakery is one of the city’s most coveted brunch spots with a menu of Anglo-French inspired dishes including organic vegetable tarts, fresh salads, buttery pancakes, eggs, and delicious pastries in the form of shortbread, cookies, scones, and carrot cake! The Picasso Museum recently re-opened in October 2014 which was a major event as far as the French art and museum circuit was concerned. Housing what is arguably the most important collection of Picasso paintings and sculptures in the entire world, this museum is set in an impressive 17th century style hotel with over 400 pieces of art in 40 rooms covering 3,000 square metres of exhibition space. With the exception of the Champs-Elysées, you won’t find many shops open in most neighborhoods. Luckily this is far from the case in the Marais. Head directly to rue des Francs-Bourgeois and rue Sainte Croix de la Bretonnerie and wander in and out of the many thrift shops in the neighborhood. Avid thrifters won’t want to miss a visit to Free ‘P’ Star ( 8 Rue Sainte-Croix de la Bretonnerie, 75004 Paris) while coveted fashion brands like Zadig & Voltaire and Comptoir des Cotonniers which are typically open on Sundays and can also be found along rue des Francs Bourgeois and rue Sainte Croix de la Bretonnerie. A trip to the Marais would not be complete with a visit to rue des Rosiers, the popular street which houses the best falafel in the city. Take a walk down this historic street and you will find many falafel options, but we suggest you continue straight ahead to the tried and tested L’As Du Fallafel. Guests have the option of dining inside or taking their sandwiches to-go and while it may require a bit of patience and will-power, we recommend the take out option and heading to the nearby park at Place des Voges. 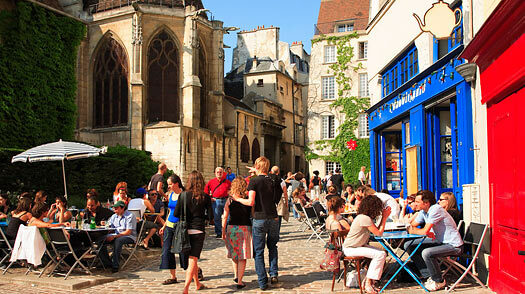 Whether you managed to bring your falafel all the way with you or not, finish off the day at Place des Voges. Surrounded by stunning architecture, beautiful gardens, and charming cafés, this is the oldest planned square in all of Paris and a prime spot for people watching. Stop for a drink at one of the cafés or find yourself a comfortable spot on the neatly trimmed grass or on a nearby bench and sit back and relax, that’s what Sundays are for after all, right?